The Flip-Rite® Handling System’s power slings gently lift and rotate objects. The slings enclose the center of gravity providing a controlled, stable motion. Optional features may include the Level-Rite®, a powered load leveling device, or custom fixtures for turning highly irregular shapes. Separating, rotating & re-assembling die sets is always a problem. 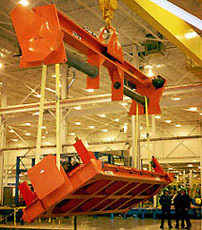 With the Flip-Rite®, you can accomplish all operations faster anywhere there is overhead crane service. You can separate & rotate the die set right on the press, eliminating transfers to the tool room for a simple repair or tool change. The proper welding position in any fabrication process is always an important consideration. With the Flip-Rite®, you can rotate the workpiece so all welding can be performed in a “down hand” position, improving weld quality. The result is labor efficiency, production time savings, and realistic employee ergonomics. With the Flip-Rite®, you can rotate trailer frames so that rear wheel assemblies (bogies) can be lowered onto the frame from overhead. Trailer manufacturers have used this method to achieve a faster & better method for carrying out welding & assembly procedures. An extra bonus is the ergonomic benefit to employees. Repairing concrete is almost as costly as manufacturing it. Much damage to concrete occurs as a result of wrangling the shape on the ground. The Flip-Rite® Handling System will reduce the need for costly repairs & significantly increase handling speed. 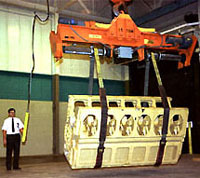 When machining an expensive engine block, you want to avoid damaging it while moving or rotating it between operations. With the Flip-Rite®, the positioning can be done gently and precisely. 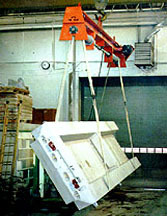 It only takes the push of a button to move or rotate any size part from 100 lbs to over 100 tons. The Flip-Rite® has been used to rotate 30 ton railroad cars & locomotive truck assemblies. There are many systems in operation turning a variety of railroad equipment & assemblies including fuel tanks, hopper cars, gondolas, ore cars & tamper frames. 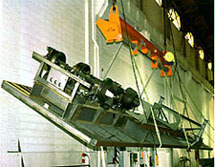 Because the headroom was limited, ITNAC® engineered a system to rotate a railroad car during assembly by using two fixtures mounted in the main frame rail. 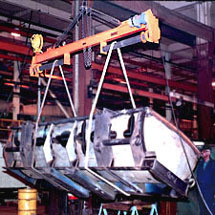 The rotation fixtures were engineered and manufactured by ITNAC®. We supplied the complete system, Flip-Rite®, and Radio Control and Rotation Fixtures for a “turn-key” system. 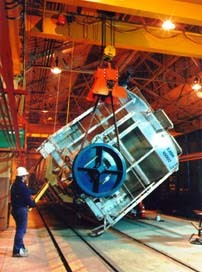 Note that the railroad car is very close to the floor and the Flip-Rite® module is below the roof of the railroad car. It was truly a challenge that was completed successfully. We currently have systems turning all forms of railroad cars. The Flip-Rite® Handling System has also been successfully used to turn: Airplane Wings, Trailer Tanks, Boiler Tanks, Boats, Conveyor Sections, Bridge I-Beams, Bundles of Sheet Metal, Composite Panels, Satellites, Dump Bodies, Glass, Mining Buckets, Truck Frames, and much, much more!